I sit in the jungle, drenched in a mixture of slowly crusting sweat, pungent DEET, and drying blood. As I make home in a treehouse some 30 meters off the ground, a loyal mosquito net acts as a best friend throughout my trekking. The humidity is powerful. Deep, heavy breaths. Wet, sticky skin. Parched lips. The jungle is a mystique felt, not seen. When the lights go out, it seems all species of wildlife look like plants. All plants, like wildlife. Eyes glow from the overgrown, green depths. Unimaginable animals become reality to the naked eye. Snakes, frogs, spiders, insects, and jaguars thrive. For when the lights go down, the chorus begins to grow from the black depths of the jungle. Soon, all join in, bouncing echoes, thrills, and shrills off of one another. The jungle consumes whatever lays around it. It grows over itself, continuously expanding. Competition is fierce, as sapping nutrients from a neighboring fern is justified under law. Darwinian Law, that is. Indeed, the strongest do survive. But even in the most devilish of settings, symbiosis exists. It runs strong in a cold world where collaboration means survival. Against all odds. Against all bets. The jungle feasts off of it, saturating its vein-like roots to draw energy. Yet some form of unrecognizable beauty emerges from the black jungle. From the powerful waterfall that throws itself down below. From the thick brush that hides creatures of alien-like demeanor. From the cloudy, moist skies through which vultures and hawks glide. For this is the jungle. Nothing is given, all is earned. A trait so enticing with its power. For this power is that which shows how life is multitudinous. From this perspective a new light emerges. A new narrative gives way where the terror and the adrenaline of the unknown jungle is buried. And the seeds, shallow though they may be, begin to grow exposing oneself to the power of the connected environment. Sight is not needed here, nor welcome. Smell, taste, touch, and hearing reign supreme. 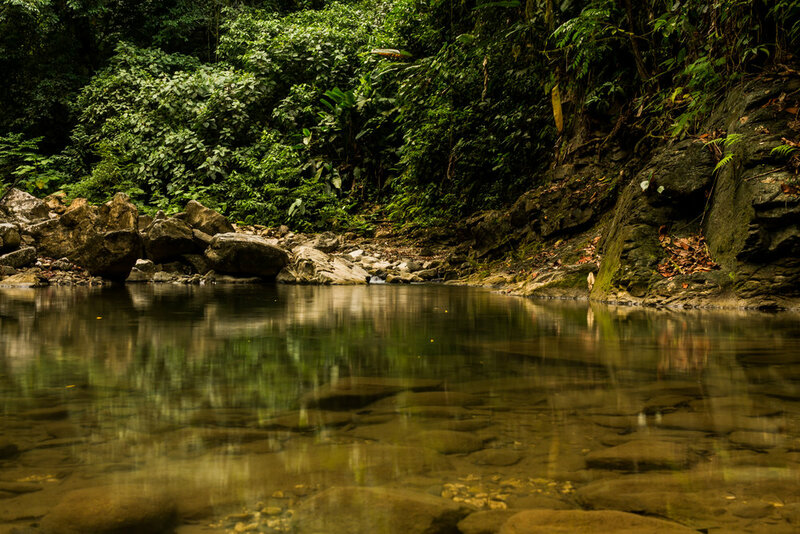 From this light, the dark depths of the jungle seem irresistibly delightful. But those seeds are shallow in a fierce place such as this, particularly for the feeble human who plays guest in the dark jungle.